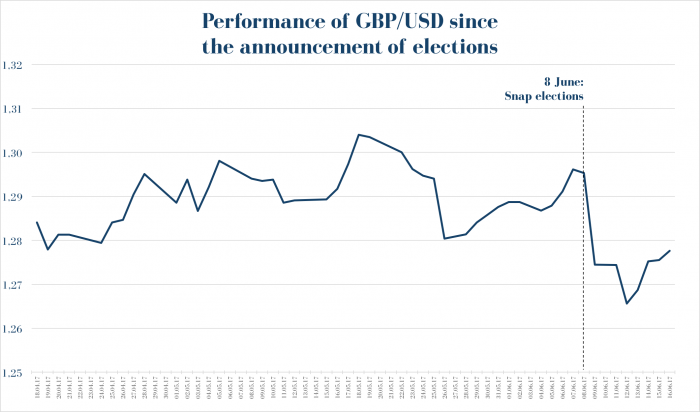 British markets became even more volatile as Theresa May’s plan to strengthen herself on snap elections failed. In our analysis last week, we expected that further uncertainty may come in the UK but this is probably the worst-case scenario before the Brexit talks. Two months ago, UK’s prime minister announced the snap elections with a stable lead in her mind. Based on the polls that time, she could have been sure not only to win the elections but to get further lead. May also hoped to strengthen herself against her opponents in her own party, in the Parliament and in the EU too. On the elections last week, she failed miserably. Although she won the elections, instead of having more representatives in the Commons, her party lost majority. The Conservatives now must find a coalition partner to govern and they already have problem with their first candidate, the DUP. They may strike a deal, but governing in coalition has always been hard. 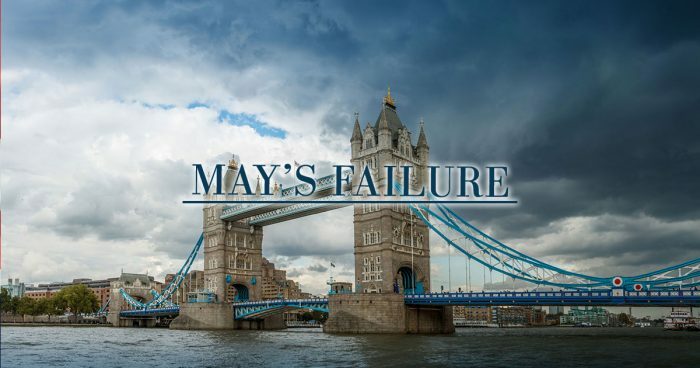 What’s more, the failure of May and the weakening of the Conservatives will bring political fights. Many also believe that May should quit and there are already theories when she could step down as Prime Minister. All this is a lot of uncertainty for the UK. This scenario is probably the worst for the UK. Why? As we wrote last week in our analysis – which was published on MarketWatch too – uncertainties hurt the British Pound greatly. No wonder the market reacted to the news harshly: right after the results of the elections came in, the GBP started to fall again. But this is not only a domestic issue. The UK starts the Brexit talks this month, and now their lead is a lot weaker than it was just a month ago. Brexit is partially a domestic issue as the UK will have to create hundreds of new laws for leaving the EU. Without majority and a stable support, legislation becomes a lot harder for the Conservatives. The EU was also tough with the UK during the Brexit talks so far, and they did it on purpose: the European Union wants to discourage any other members from quitting. With her snap elections, Theresa May probably wanted to show her power to the European Union. She wanted the biggest domestic support she could get but now she is facing the talks that officially start this month with a huge loss behind her. In the meanwhile, Emmanuel Macron seems to get stronger and stronger in France and that means even tougher Brexit talks for the UK.